The birth of the Mercedes-Benz Silver Arrow took place 80 years ago. To be more exact, on the night of June 2nd, 1934. 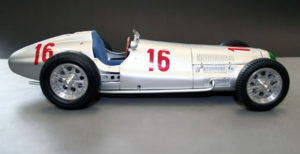 Mercedes built two newly-designed W25 vehicles for 1934 GP racing. 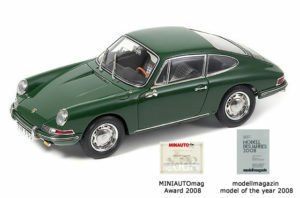 They were registered to debut in the Eifel race at the Nürburgring on June 3. Mercedes was eager to become the world leader in racing again. The W25 vehicles were developed in accord with the 750kg regulations, a new formula that was designed to mitigate the ongoing strife to develop high-speed cars by all means. The official weighing report that came out on the afternoon of June 2 must have stunned the Mercedes racing team. 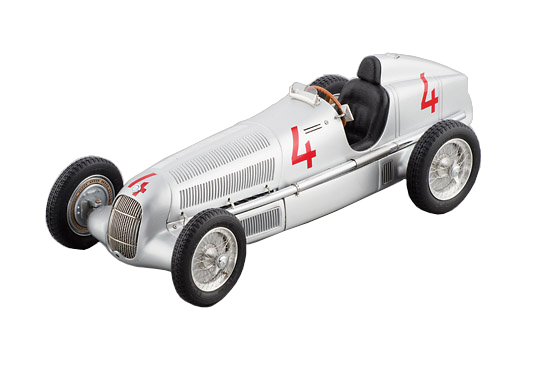 Painted in white, the classic German race color, the W25 were each found to be approximately 1 kilogram too heavy. This would disqualify them from the start line of the next day. Legend has it that Alfred Neubauer, the chief of the Mercedes racing department, came up with a remedy. “We have to remove the paint!” was his order. So the whole team set out to work feverishly throughout the night. When the cars were checked again the next day, the weight was just right. Neubauer’s idea had saved the day. 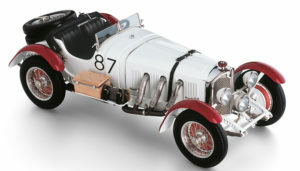 Imagine the surprise when people saw the new looks of the German racing cars that were covered in an aluminum sheen! Both Manfred von Brauchitsch, the young daredevil German driver, and Luigi Fagioli, a cool-headed teammate from Italy, were geared up for the race. They were burning to put up a successful premier for the shiny W25 on June 3. The audience and the press could hardly believe their eyes when they first saw the radiant silvery rockets. 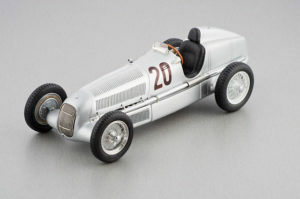 After Brauchitsch raced his #20 car to the championship in record time, the moniker “Silver Arrow” spread like fire. Fagioli managed to stay in the top flight until the 13th lap, during which he had to retire. However, almost a year later, on April 22, 1935, it was his turn to carry the day at the GP of Monaco. He won the race in a 1935 version of the W25 with starting number 4.